In this age of instant technology, we are bombarded with an overload of information and demands of our time. Most of us are usually working on two projects at once when new ones are placed on our desks and to add to this we’re on the phone to someone who has a million questions about something and three new emails have just come in. Before you know it you are juggling tasks with a speed worthy of Super Mario! Congratulations, multi-tasker. This week’s post is not about being more efficient in your multi-tasking, instead, I’m going to do the opposite – I’m going to show you how not to multi task! If you have several pages or tabs open on your computer, then you’re probably multitasking. The same goes for your desk – if you have several file folders or papers out that you’re working on, you might well be multitasking. Multitasking is more likely when you’re working on a project or task you’re not excited about. For instance, creating a spread sheet analysis might be an unwelcome task, so you might frequently check your email or do some research on a new assignment in order to lessen the pain of the current task. 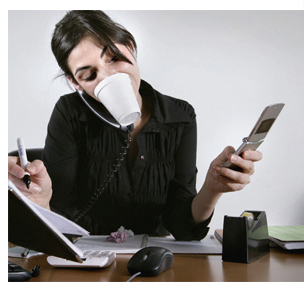 Frequent interruptions can also cause you to multitask. For instance, you might be writing your Business’ budget when a colleague comes into your office with a question for you. You then carry on trying to tinker with the budget as you answer their question. Plan your day in blocks. Set specific times for returning calls, answering emails, and doing research. Manage your interruptions. Keep a log showing who interrupts you the most, and how urgent the requests are. Once you’ve compiled a week’s worth of interruptions, politely but assertively approach your colleagues with a view to managing and reducing their interruptions. Learn how to improve your concentration so you can focus properly on one task at a time. Doing this may feel awkward at first if you frequently multitask. But you’ll be surprised at how much you get done just by concentrating on one thing at a time. Every time you go to check your email or take a call when you’re actually supposed to be doing something else, take a deep breath and resist the urge. Focus your attention back to what you’re supposed to be doing. If you get an audible or visual alert when emails come in, turn it off. This can help you avoid the temptation to check your inbox whenever you get new mail. Whenever you find yourself multitasking, stop. Take five minutes to sit quietly at your desk with your eyes closed. Even short breaks like this can refocus your mind, lower your stress levels, and improve your concentration. Plus it can give your brain a welcome break during a hectic day. There will be times when something urgent comes up and you can’t avoid interruptions. But instead of trying to multitask through these, stop and make a note of where you left your current task. Record any thoughts you had about how to move forward. Then deal with the immediate problem, before going back to what you were doing. This way you’ll be able to handle both tasks well, and you’ll leave yourself with some clues to help you restart the original task more quickly. If you find your mind wandering when you should be focusing on something else, you need to guide your thoughts back to what you are doing by putting yourself in the moment. For example, you might be sitting in an important team meeting, but thinking about a speech you’ll be giving soon. Tell yourself, “I am in this meeting, and need to focus on what I’m learning here.” Often, acknowledging the moment can help keep you focused. Remember it’s important, for your mental health, your sanity, and your productivity. You simply cannot be at your most effective if you are running around, putting out fires, and getting over stressed because of it. Taking the time to gain that control will make all the difference in the world. If you find it very difficult to do this, consider outsourcing some tasks, it’s less for you to deal with. Contact us if you think we can help: info@virtualoffices.ie.